Andrew Lord: Sorrow, a sculpture of thirty pieces and related work. 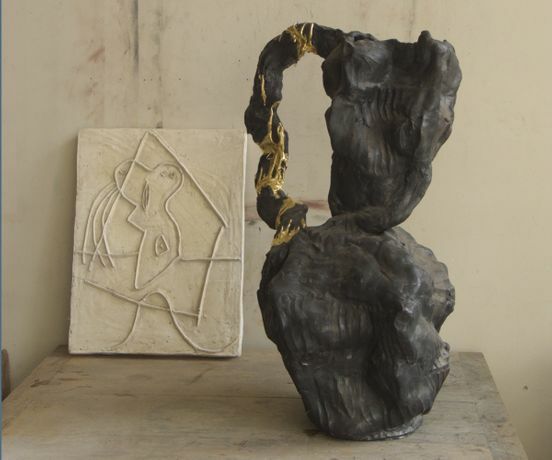 Save Event: Andrew Lord: Sorrow, a sculpture of thirty pieces and related work. Share Andrew Lord: Sorrow, a sculpture of thirty pieces and related work. Gladstone Gallery is pleased to present an exhibition of historical work by Andrew Lord. Long known for his sculpture in ceramic, Lord’s work continually challenges the expectations of the medium as he seeks to mold in clay works that trace the haptic experience of his own senses and experiences. In 1978, Lord created a body of work whose shapes and surfaces were based on the fall of light onto different shaped maquettes. As if drawing from life, or painting a landscape en plein air, this process recorded his observations in three dimensions. By 1979, he began to think of these groups of maquettes as works in themselves and showed them in an exhibition with Art & Project in Amsterdam. With these pieces Lord found ceramics’ ability to take on the commanding dimensions of painting. The exhibition is organized in collaboration with the Kröller-Müller Museum in Otterlo to mark the occasion of Andrew Lord’s gift in honor of Adriaan van Ravesteijn and Geert van Beijeren, founders of Art & Project (1968-2001) in Amsterdam and Slootdorp. Andrew Lord was born in 1950 in Rochdale, England, is based in New York City and also works in Europe. His work has been the subject of numerous solo exhibitions at international institutions including The Carnegie Museum of Art, Pittsburgh; Camden Arts Center, London; Rijksmuseum Twenthe, Enschede; Milton Keynes Gallery, England; and Santa Monica Museum of Art, Santa Monica. He has also been included in group exhibitions including: “Atelier 15,” Stedelijk Museum, Amsterdam; “Westkunst. Heute,” Museen der Stadt, Köln; “Anderer Leute Kunst,” Museum Haus Lange, Krefeld; the 1995 Whitney Biennial; “Site and Insight,” MoMA PS1, New York; “The Third Mind,” Palais de Tokyo; and “Artists and Poets,” Secession, Vienna. In 2014 Andrew Lord was resident of the Cité International des Arts Paris; in 2015 he participated in the Royal Academy of Arts Summer Exhibition. In the Fall of 2017 an exhibition of bronze sculptures will be presented on the Bluhm Family Terrace of The Art Institute of Chicago.